I’ve done my fair share of exploring the Italian Riviera + Amalfi Coast, but hadn’t made it over to Positano. I decided to check it out before my stay in Capri, which gave me enough time to check out some places that had been on my list for years! I stayed at Casa Cosenza, a quaint B&B recommended by many many people. It’s proximity is perfect to the main town and beach. Just under 200 steps up from the main spiaggia, it's the perfect home base for your stay in Positano. If you're looking to splurge on your stay, nothing beats Le Sirenuse. This once family villa turned into one of the world's most renowned hotels is a jewel of the Amalfi coast. They have a breathtaking rooftop lounge/bar, Franco's Bar, that is open to non-guests... perfect spot for a sunset spritz! I've got to say, my favorite cuisine is by far that of Southern Italy. Everything is insanely fresh and grown to perfection by the hot Italian sun which makes for delectable food (hello pomodoro and limoncello!!) Breakfast is kept relatively light with an espresso, cornetto and some fresh fruit. On the main marina, Chez Black is a well known classic for their simple food that keeps people coming back - the pizza margherita (shaped in a heart!) and seafood linguine are not to miss. Up the hill a bit, Casa e Bottega and Next2 are great contenders too. There isn't too much of a bar/nightlife scene, but Franco's of Le Sirenuse for great music in a magical outdoor atmosphere. The Amalfi coast has a ton to offer, with everything from day hikes in the hills, shopping at Missoni to plain and simple R&R. Positano is a great town to stay in because of it's proximity to other towns and islands. You can easily take a day trip via train or boat to Napoli, Sorrento, Amalfi, Ravello and Capri. The ferries run very regularly during high season (May-Oct) but renting a private boat tour is a great option as well. You can rent a boat and skipper for around 300€/day. Positano is one of the most popular coastal destinations in Italy amongst regions like Cinque Terre and the isle of Capri. I’ve now been to all three and can give a little insight to what makes each unique. My favorite of the three by far. It’s chic, timeless, and the ultimate destination to top off any Euro summer. Spend the day lounging at La Fontelina then walk through the main town, stopping into Dolce & Gabbana and Gucci for an souvenir or two ;) This island is my favorite place on the planet and absolutely nothing compares to a hot July afternoon swimming in the inky blue Amalfi water or cruising by the Faraglioni rocks, spritz in hand. 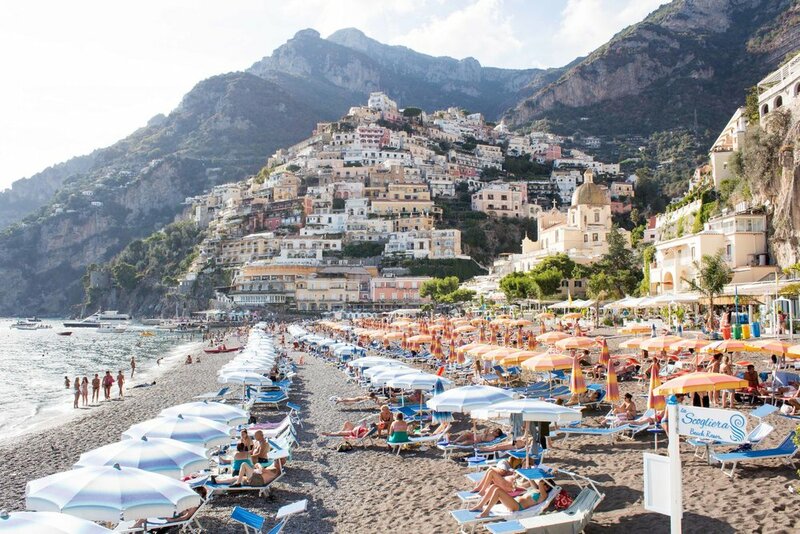 Positano has something for everyone… there are a couple of beach clubs like La Scogliera to unwind at. There is also a main spiaggia right by the port if you aren’t opt to paying for a sun bed. Positano has really great world renowned food and that Italian seaside town charm we all crave. It's gotten a little tourist heavy in year's past... but if you're looking to do an Amalfi coast trip, I think this is the best home base to venture out elsewhere in the region. This region in the Northern part of Italy is by far the most ‘adventurous’ and commercial of the three. Instagram and Pinterest have unfortunatley over populated it in the past five years or so. When I went a few years back it wasn't talked about much here in the US. You see a lot of backpackers, students and young people on a seaside holiday. Of the five towns, Manarola and Vernazza are my favorite with some amazing cliff jumping and hidden swimming spots. It is by no means chic, but is worth seeing even as a day or weekend trip from Florence or Tuscany.